I wanted to follow up on my previous post about different ways to define a "nonpayer" with some data from the IRS. Yesterday I talked about three possible definitions of a nonpayer of federal income tax: 1) someone whose federal income tax liability is zero or negative (the standard definition and the one Mitt Romney meant), 2) someone whose effective marginal tax rate is zero or negative, or 3) someone who has no taxable income. 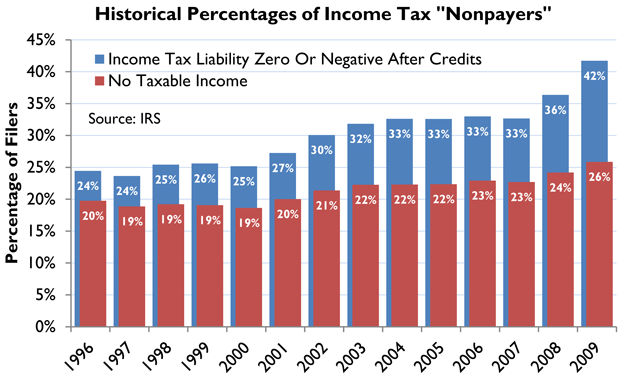 The IRS has readily accessible data for definitions 1 and 3 (though 2 requires much more work), so I've made a chart showing the percentage of filers whose income tax liability is zero or negative (the broader definition) and the percentage of filers whose taxable income is zero (a smaller, but still significant, group of people). There are plenty of filers who have no income tax liability but do have taxable income (16% in 2009) – it's just that the credits they get back equal or exceed the tax they owe. However, these people still have an interest in keeping tax rates low, because their bottom line tax liability, while negative, is nevertheless still affected by statutory tax rates.